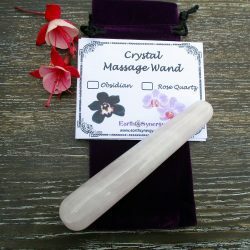 These lovely crystal wands have multiple healing uses; they are perfect for channeling energy in Reflexology & Reiki while receiving the healing property benefits of the crystal directly through the skin. This smooth stone is also great for therapeutic massage; it fits nicely in the hand. It is cold at first touch but warms up to blood temperature quickly. You can apply even pressure with it. It also has smooth rounded ends which can be used on pressure points. This type of crystal is also referred to as a Yoni Wand & can be used for sensual massage.